Indigo is a color that combines blue and violet. It has a strong association with the New Age and magic rituals, so it’s a color with a lot of spiritual meaning. Let’s take a look at what can indigo mean. Indigo can boost up the perception a person has of things and encourage unconscious processes, such as intuition. This means that indigo can help develop a deeper awareness of what is going on. It also encourages other states of consciousness, so it’s a good color to use for meditation. Indigo is a color related to devotion and helping others. It suggests fairness and impartiality. The color has a deep a quality that transmits wisdom and authority. This color is closely related to organization. A lack of organization throws it out of balance. 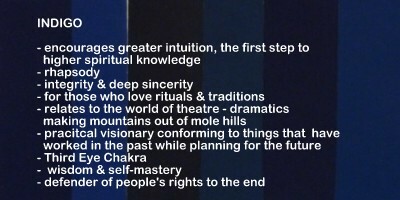 Indigo also is associated with rituals and traditions, which is why it is so commonly used in the New Age context. On the negative side, indigo may be associated with conformity too, with sticking to the rules and traditions that may no longer apply. Indigo is also related to religion and religious traditions, as well as to authority. It’s a more formal color that blue, for example. Indigo stimulates the creative part of the brain. It can help with spatial thinking. Among the arts, indigo is mostly linked to theater, also having a dramatic flair. People who overuse indigo may also be quite dramatic. This is a very spiritual color. It is linked to increased intuition and perception. It suggests fariness and integrity, being an authoritative color. Indigo has a lot to do with structure and implies a need for organization. It has to do with rules, traditions and religion. As for the arts, it is linked to creativity and spatial thinking, having a special relation to theater. The negative aspects for indigo are an inability to work without organization, as well as conformity and an excessive adherence to tradition. It can also be linked to “drama queens”. Great post 📮. It’s a lovely color. Love the color. It fits right in with my personality.